Shut Up and Listen!! | Cyndie Cornelius | 865-441-0045 | Great Smoky Mountain TN Real Estate for Sale,Search For Homes and Land For Sale in Sevierville, Pigeon Forge, Gatlinburg , Wears Valley and Townsend. WHY THE SMOKIES? "Your Mountain Real Estate Professionals"
A while back I was privileged to take a hike with an icon of this area. He is considered the “Artist Laureate of the smokies”. His name is Lee Roberson. Gladly, his art gallery in Wear’s Valley is open again; but for a time, the buildings stood empty. The aura of the site will take a grip on you. It certainly did me. Lee was born the same year as the Smoky Mountain National Park. As he would put it, they grew up together. His knowledge and love of the mountains are apparent in his artwork, his poetry and in his being. I knew when I met him I should shut up and listen. Soooo…I did. Warren and I met with Lee early one morning and drove to a piece of property Lee owns in Wears Valley, one hundred acres of land that backs to the park. I was very excited and made sure to have the camera on FULL CHARGE. We strapped on our hiking shoes, grabbed our best sticks, filled our water bottles and fell in behind him, like baby ducks behind their mama. The canopy of trees made the ball caps and hats, unnecessary. It was shady and cool. Moments after stepping into the woods, you could hear the roar of the mountain stream. I am a real sucker for streams, and a bigger sucker for ROCKS…MOSS COVERED ROCKS! They were everywhere. It was difficult to stay focused on any one thing. This is undisturbed land. It far surpassed the park trails, because, there were no real trails. For most of the day we used the stream as our path. Thank goodness for Gortex! My feet stayed dry as a bone. Our destination was the site of an old cabin. As we approached the site we could see an opening where the sunlight sifted through the trees and lit up the area where the cabin had once stood. 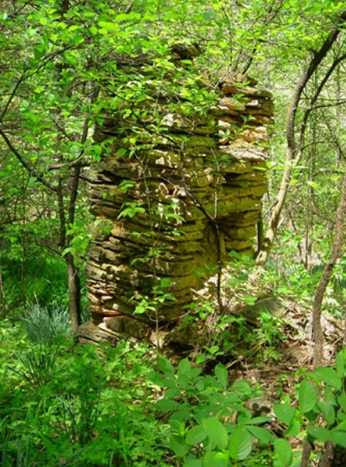 All that remained were the ruins of an old chimney. It stood like a monument to those who had endured the lifestyle of the mountains so long ago. The area was surrounded by domestic flowers, iris, daffodils, and rose bushes that had been placed there by some loving hands, many years before, and had multiplied at their own will. We stopped there to take it all in. Lee told us of the brothers who had lived in the cabin. They were ill with some disease, I can’t recall exactly what, and had removed themselves from the rest of the world. Lee was quite prone to stories and that was one of dozens we heard throughout the day. We moved into the hollow, or holler as it is pronounced by many, to reach the outcroppings of rock. They were up above us and Lee began to scurry upward to reach them. He said the Indians had used the rocks for shelter and showed us how they were blackened on the underside from the fires that had burned centuries ago to warm those taking refuge there. 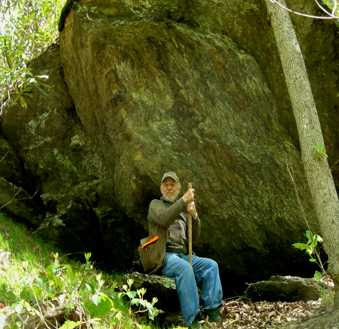 Outcroppings are rocks…I love rocks! SOOOO …I had to follow him up to get a closer look. Now let me give you another lesson here. Climbing up is not the hard part. You can grab on to things, and pull up on some very difficult terrain. It’s the coming down that can KILL YOU! When I retreated from the rocks, I managed to use my hiking stick as a pole vault! I could be writing this from traction; however, I caught myself just in the nick of time. Warren and Lee were relieved. They both had for a brief moment, thought they might be carrying me out. At this point we began our trip back. Beverley, Lee’s wife, had cooked lunch and we were already late…really late. We walked a little faster in hopes of keeping Lee out of the dog house. We each attempted to come up with some really good excuse for being so late. We finally decide on the truth, she would understand that Lee tells a LOT of stories and stories take time, and time is what we ran out of! Beverley had prepared a delicious vegetarian lunch, and once it had been devoured, we all sat back like kitties in the sunshine and talked about the joys and benefits of an afternoon nap…. Before we left for home, our friends decided to give us one more treat. As we headed down the gravel road into the mountains behind their home, they began to tell of the place they always referred to as the “Gallery”. This is where Lee had spent most of his time creating the paintings so many have come to love. He moved out of his home and turned it into a gallery; he lived in the studio for a while, creating his works of art inspired by the mountains and their way of life. When that became too small he created another, larger gallery. 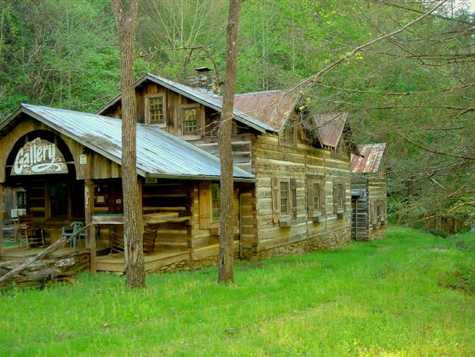 To be certain his artworks were displayed in the proper setting, Lee went to work finding old log cabins and having them reassembled on his property. Visitors came to the gallery not only to view the paintings by Lee, but to sit for a short while in a mountain setting that was also a work of art. As the “Gallery” came into view and I could feel my eyes well up. 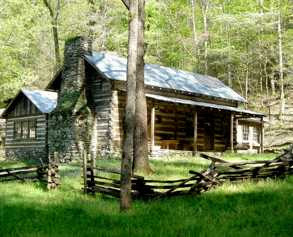 Those of you that know me also know that if there is one thing I love more than mossy rocks, its old log cabins! I was in heaven again. If you stand still and listen, you can almost hear voices of those who have visited. Tens of thousands of people there to enjoy the work of one man and the beauty he created both on canvas and in setting…but in order to hear them you must …”shut up and listen”. Our day with Lee and Beverley was one I will always remember. A few months after our visit, Lee decided to open the Gallery once again! For the next two years it was again possible to experience the beautiful sight of perhaps his greatest masterpiece built into the “holler” of the Smokies, The Gallery. We are sad to say that our friend Lee Roberson passed away unexpectedly in June of 2014. We will miss his work and his stories and his Lessons of the Mountains. He was an advocate of the Smokies. He had a passion respect for the mountains and all they had to offer. He has left a lifetime of artwork to inspire others for years to come and to keep the spirit of these mountains alive. I enjoy communicating with all of you in my own personal way. My pleasure comes from sharing my adventures with you and helping you visit this beautiful place through me. I appreciate hearing from you when I send out something that inspires or touches you in some way. I understand that living here is a dream for many, but that dream must wait until life will let you get here. I GET IT! I appreciate each of you and your interest in what I have to say or show you. Thank you for your continued support and inspiration to me.